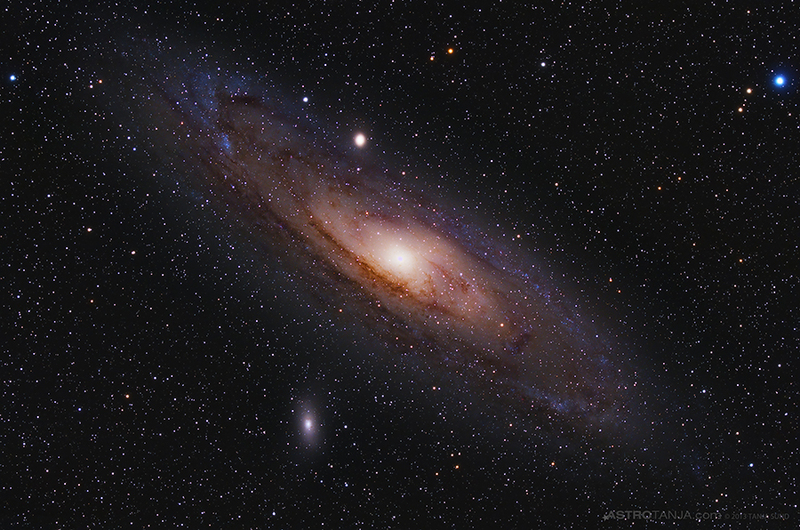 Andromeda eludes me from my location (Jozi, South Africa). In a relentless pursuit to capture photons, I packed my gear and headed north for some quality astro imaging. 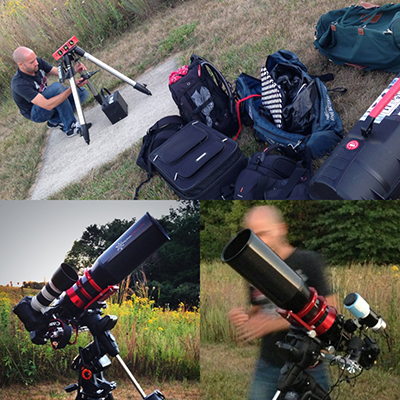 First stop Iowa, USA, where I met up with Cory Schmitz (@TheAstroShake) and tested the setup the same night. Some weeks prior to my arrival I purchased the Celestron Advanced VX and had it delivered to Cory for the imaging trip. The only equipment I would bring; my Officina Stellare HiperAPO105, Canon DSLRs and lenses. A little disorientation and jet-lag couldn’t suppress the need to image M31. Travelling halfway across the world means business. With a good few frames in the bag, the goal was to add more data – or even shoot fresh from our dark location in Nevada. We had 2 nights for me to get enough M31 and other northern DSOs. Unfortunately weather didn’t agree and I lost 1 of the DSO nights due to strong winds. 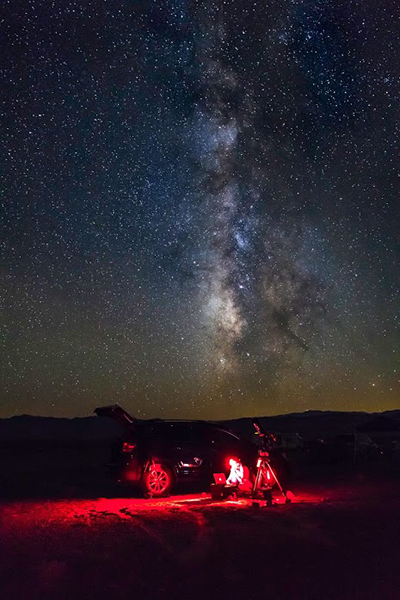 The following night we joined a star party that set up in Monte Cristo’s Castle, west of Tonopah off Highway 95, left of the middle of nowhere. As twilight approached the wind died down and left a superb dark clear sky. Game on! I was fighting the clock to get more M31 data and other northern targets. A toss up between shooting deep data or imaging more targets. Reevaluating my prior data of M31 we decided it would be more efficient to add at least another hour and then move on to some other northern targets. Flats shot on 1st night, re-used on data from the 2nd as framing was exact. I recently made the PI switch and although the integration is invaluable, I am still finding my feet with editing. This is the workflow I follow with most of my images, not always in this order and possibly a few duplications of these in-between. I make subtle changes to my images, and rather redo them over and over. I also need to point out that I started from scratch about 4 times over before I was happy with my final edit. This is where my PI comfort level stops. I have years of experience in PhotoShop and find it easier to use layers and brushes to get to the same result. For a while now I’ve tried to only stick with PixInsight, but finding it pointless to work with something that’s not working for you (momentarily). It’s a steep learning curve, and you should use what feels natural and works for you. That said, DBE, HDRm ACDNR have become invaluable to me. – Levels – colour adjustments. Then I’ll duplicate and mask areas of interest. For the background “space” I was happy with what I was able to achieve in PI, and left as is. I duplicated the galaxy to work on this individually, adjusting levels & curves. For dust lanes; adjusting contrast, unsharp mask, sharpening brush, brush tool with low opacity hard light mix and dark paint colour. Again, I make slight changes and save my work along the way. Is there a right and wrong way? Probably. But this works for me. A great read Tanja! Have been following yourself and Cory on Twitter for some time now (nightskysteve) and really admire both of your works. Its nice to see a little of what goes on behind the scenes. Tanja I follow you in tweeter some time ago. I really admire your work getting astrophotos. I am a beginner stargazer. My first one is a Celestron 127 and I am thinking to jump to a Celestron VX Edge 8″ or CGEM HD 8″. Could you give me your opinion about this? Thanks a lot and again congratulations for your great job. Thanks for the kind words. It all depends on what you want to photograph. I see you’re already going with the 8″ SCT, so then it’s just a question of the mount. The AVX is newer tech and made specially for astrophotography. I have the CGemDX as well, and really enjoy it – but I do prefer imaging with my Advance VX. My advice is see which mount can take the most payload capacity, and go with that.